While the Chinese companies have taken the Indian smartphone industry by a storm, some Indian players like Micromax, Karbonn and Lava are hanging around, enjoying the patriotism from the people of India. Finally, there is an Indian player that can give Micromax a run for its money, and by this we mean that the phones follow the great specs-low price model. Having said that, the company is still new and has come out with some interesting ways to acquire Indian customers. Read on to find out. The smartphones come with stock Android versions for the most optimized experience and the company claims that they have all the necessary CTA/MADA compliance agreements, CTS certified and GMS license from Google to optimize the software, which a very few companies do. Hyve Mobility is a startup that recognizes the fact that the smartphone market in India is saturated with large companies launching smartphones at all price points. To create a buzz in the market, one needs to offer something exclusive that other smartphone makers don’t. If you remember, Creo Mark 1 launched with a similar ideology, and although the value proposition was good, the smartphone did not gather much praise. However, Hyve does not want to become just a memory in everyone’s minds. A brainchild of an ex-Apple employee, Sharad Mehrotra – CEO and Co-Founder, and Abhishek Agarwal and Aditya Agarwal as Co-Founders, the company has 41 staff members who are ex-employees of companies like Ingram, Redington and other large multinationals. Hyve has launched two smartphones, Hyve Buzz and Hyve Storm, which offer everything that many other smartphones can, but with claim that after-sales service and policies that no other handset brand can match. Normal is boring, and we very well understand that. “While consumers today have lot of options to choose for a smartphone, the element of customer delight is seriously missing,” says Sharad Mehrotra, and we completely agree with this fact. In fact companies usually do not emphasize on post-customer acquisition and simply want to rake in more money through sales. Through the two phones, Hyve wants to create an ecosystem where the company takes care of its customers for atleast the next one year. After reading these specifications, you must have wondered what so special is about these smartphones. After all, every other company offers such specifications at this price. The difference comes in terms of warranty, insurance and customer support. Hyve Storm comes with 1 year standard warranty, 6 months more than other smartphones, along with 1 year pre-bundled insurance for damage protection. Hyve Buzz comes with 2 year standard warranty and 1 year insurance. In case of customer support, there is complimentary pick-up and drop service across 42,000 pin codes in the country, IVR free call centre support and access to Hyve Care, a portal and an app where users can log in their grievances and get instant support. Hyve Buzz also comes with Touch2Call patented technology that allows users to place calls directly by scanning their fingers. The smartphone will place the call as soon as the phone is unlocked with the particular finger. Buzz also comes with an illuminated notification light in the form of a hexagon. “We are glad to launch our first set of smartphone today. 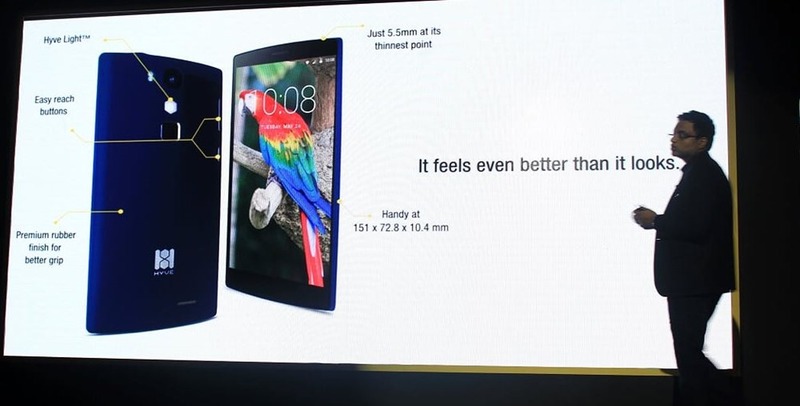 They are a great balance of amazing hardware specs, pure Android and support value proposition,” said Sharad Mehrotra. The smartphones are on sale on leading e-commerce websites like Flipkart, Amazon India and Gadgets360 and will start shipping from June 22. Hyve is also going to launch its own online marketplace, Hyve.buzz, just like LeEco’s LeMall. What do we think of the smartphones? Hyve is trying to set a trend of customer centric approach in India, which is something we completely believe in. Half of the times customers do not know whom to contact in case their phone gets damaged and keep on fiddling with third-party vendors for the same. Hyve is definitely going to create a buzz in the market for its unique propositions, but we think that is where it stops. The smartphones offer sub-par specifications at the prices, whereas LeEco’s Le 2 and Xiaomi Redmi Note 3 offer better specs at lower price points. The company has a lot of potential if it does what it promises, considering the diverse experience the three founders bring on the table. Customers are looking for peace of mind, but not at the cost of lower specifications. We feel that Hyve could have gone a step ahead and used better processors, offered larger batteries or some accessories to involve the customers a little more. If not better specs, then reduced the prices by at least Rs. 1,500 but localizing the assembly of the smartphones. Nevertheless, the smartphones are good and we should wait a few months to get a complete picture of their sales and growth. Hyve Mobility plans to launch a few smartphones this year, and do not want to rush into anything. Let us support Indian smartphone makers who are trying to disrupt the market one at a time. "Hyve Mobility Enters Indian Smartphone Industry; Launches 2 Handsets with Customer Centric Value Propositions", 1 out of 5 based on 7 ratings.